Join us on Saturday 20 October as we jam on some fresh games and controllers for Playtopia! 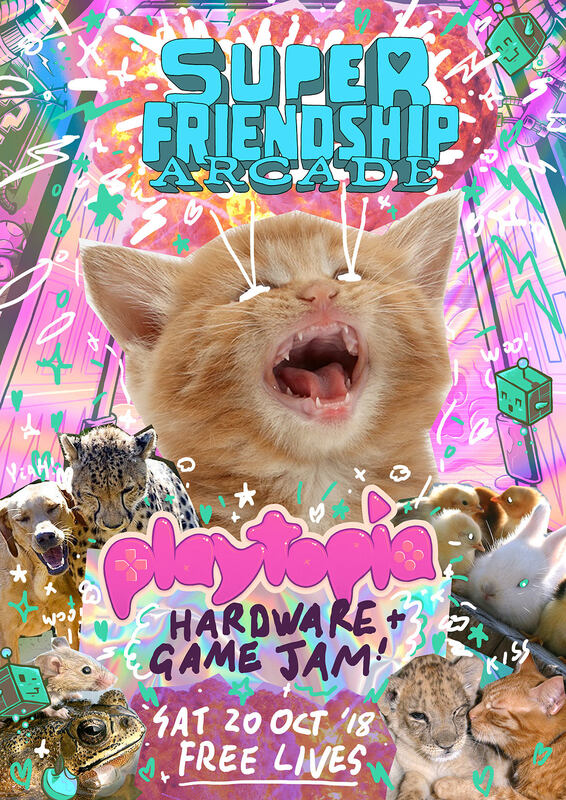 Playtopia is South Africa's very first homegrown celebration of indie games and interactive art, and SFA is thrilled to be involved! We'll have an entire arcade of mind-bending multiplayer experiences and experimental games in the festival, and this is your chance to get involved as we jam out new creations for Playtopia! Yes! SFA is all about spreading the gospel of punk party games and growing a more diverse community of creators and players! You're encouraged to attend regardless of experience level! If you're new to the world of making games or custom controllers, veteran superfriends will be around and stoked to help you out! Yourself! Bonus points for bringing a packed lunch or lunch money! Game-Jammers: Whether you want to code a game, or make art and music, a laptop computer is a good idea! Prepare for the jam by making sure you've got the right software to do the job too! Hardware-jammers: We'll have some SFA components for you to work with, but if you have access to any electronics that you'd like to play with, bring them along too! General electronic tools like soldering irons are also a good idea, but not essential! Curious about SA first home-brewed celebration of indie games and interactive art? Check out their website and RSVP to the Playtopia Facebook event! Looking forward to making things with you! Here's the poster we made for the event! Just 6 days to go till the Playtopia Jam! On Saturday we're going to be hosting a Burn The Keyboard workshop starting at 12:00 pm. Burn The Keyboard is a short workshop where we'll make some alternative game controllers out of buttons, joysticks, cardboard, duct tape and whatever else we can find lying around! No prior experience needed (you'll learn all the electronics you need in 5 minutes), just bring your most playful self and be prepared to make some creative controllers! If you have any interesting objects lying around (maybe a pool noodle, a car tyre, or an old chair?) then bring them! Let's make some weird and wonderful things.